Provide comfort for the family of Barbara Armstrong with a meaningful gesture of sympathy. 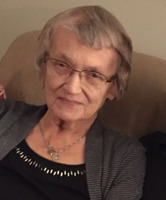 Passed away peacefully at Sherwood Park Manor on Tuesday, April 9, 2019. Barbara Mary (Chapeskie) Armstrong, at the age of 93 years. Beloved wife of the late Richard Armstrong. Dear mother of Gerard Smith (Jeanne) and Margaret Burton (Dana Stewart). Will be sadly missed by her grandchildren Steven Smith (Tawnia), Christina Bradford (Steve), Richard Burton (Michelle) and John Burton; great-grandchildren Adi, Ashton, Zander, Kyler, Jordan, Sian, Logan, and Maya; sister Dorothy Howick; and several nieces and nephews. She was predeceased by her siblings Peter, John, Frank, and Anne Stegne as well as by her parents Pauline (Rumleskie) and Peter Chapeskie. Visitation will take place at Irvine Funeral Home, 4 James St. E., Brockville on Sunday, April 14th from 6-8 pm. A Funeral Mass will be held on Monday, April 15th at 10 am at the St. Francis Xavier Church, 66 Church St., Brockville. Barbara's family wishes to thank the staff at Sherwood Park Manor for their exceptional care. As expressions of sympathy, donations to the Brockville and Area Food Bank or the LLG-OSPCA will be gratefully acknowledged. Send condolences or make a donation online at www.irvinememorial.com.